The ENC presents field trip programs to preschool – 12th grade classes throughout the school year. 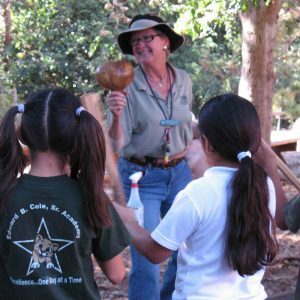 We are currently scheduling field trip programs for the 2019-20 school year at the Environmental Nature Center. There is a 10% Discount for booking a program to occur in September 2019. Program curricula are aligned with the Next Generation Science Standards (NGSS) for California Public Schools. Scroll to the bottom of the page to fill out our School Program Interest Form, or call 949-645-8489 to schedule. Click “Teacher Resources” (below) to download study guides, assessments, etc! Students will observe, analyze, and interpret patterns between what plants, animals, and humans need to survive. As they hike through our trails they will survey our meadow area to determine different types of food items animals eat in nature, build a model to demonstrate how animals and humans can change the environment, touch, smell, and taste different natural resource items, and enact how they can help reduce the impact humans have on the local environment. NGSS alignment: K-Ls1-1: LS1.C, K-ESS2-2: ESS2.E, ESS3.C, K-ESS3-1: ESS3.A, K-ESS3-3:ESS3.C, EST1.B. 1.25 hours, $7.50/student.Minimum 10/maximum 120. Located at Buck Gully Nature Reserve, this program provides students with exposure to a variety of environmental science careers in botany, geology, ecology, entomology, and ornithology. Middle School students explore these STEM careers as they hike through the breath-taking trails of the reserve and conduct science-based observations, data collection, hands-on experiments, and field data analysis. Each student will undergo a brief exposure to the 5 listed science careers as well as be immersed in 1 of the 5 careers to grasp a deeper understanding of that career. For their main career, students will be randomly divided to become an ecologist, geologist, or botanist. The geologists will be researching suspended sediment transportation, botanists will use quadrants to assess the biodiversity of native and non-native species, and ecologists will investigate fertilizer concentration in soil. This *2 1/2 hr program is $10.50 per student, minimum 20 students-maximum 45 students. Please advise the student to wear water appropriate shoes (or bring an extra pair along with socks) as some data collecting will be taking place in the stream. If you need to cancel your program for any reason, please email [email protected] so that we have it in writing. We will respond via email that we received your cancellation. If you do not receive a response to your email, please call 949-645-8489 and speak with Corina or Lori. If cancellations occur at least two weeks before the program, no fees apply. If cancellations occur within two weeks before the date of the program, the minimum fee for the scheduled program will be charged. Fees do not apply if cancellations occur due to inclement weather. Please complete this form if you are intersted in scheduling a program. If a date you choose is available you WILL be added to the calendar and then receive an email confirming this. If none of your dates is available we will contact you with comperable dates. Do NOT complete this form if you are just inquiring about scheduling a program. If you have questions that are not answered in the text above, feel free to call 949-645-8489 or email [email protected] with your questions prior to scheduling. Thank you!